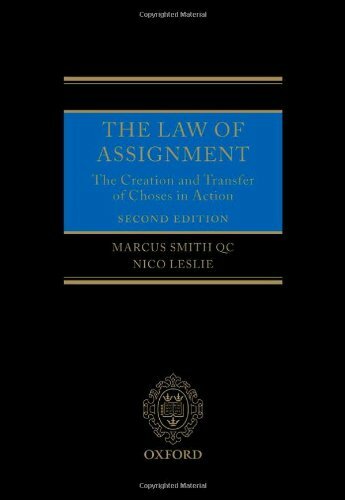 This new edition of The Law of Assignment provides a comprehensive treatment of the law relating to intangible property or choses in action. It considers all forms of intangible property (debts, rights under contract, securities, intellectual property, leases, rights/causes of action and equitable rights). The book considers the nature of intangible property, how it comes into being and how it is transferred or assigned. It considers the consequences of transfer, including what property cannot be transferred and the difficult question of priorities. The book's approach is both analytical and practical. The first parts of the book focus on general principles regarding intangibles and their transfer. The book then moves on to consider the law relating to particular types of intangibles, securities (paper, immobilized and dematerialized), insurance contracts, leases and intellectual property. There is an expanded section on the taking of security over intangibles, as well as new material on rights or causes of action to reflect recent developments in litigation finance and no-win/no-fee arrangements. The Equities chapter is expanded to cover the transferability of notes and other debt securities, while the section on assignability of debts is expanded to include practical treatment of factoring. Also included is new comparative European and US material.